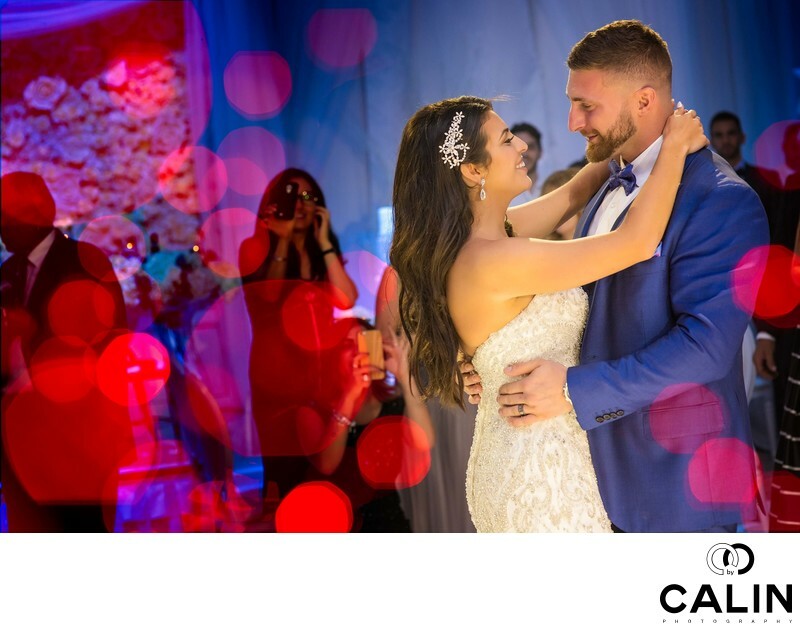 The first dance is another great opportunity for wedding photographer to capture beautiful moments of the big day. Given that all the tension of the special event has dissipated by the time the bride and groom dance for the first time as husband and wife, the first dance is a moment when the couple finally takes time to enjoy themselves. As with the other parts of the wedding day, during the first dance I try to deliver a variety of looks. As such, I shoot tight using a medium telephoto lens (here the can 85 mm F1.2) to capture all the emotions and the reactions of the bride and groom. Also, I used my beloved 35mm 1.4 lens to take environmental portraits of the couple. Besides, a very the animals and try to shoot according to the principle get low, get high, get close, get far, get dirty. This ensures that I deliver a variety of photographs that are different from what the couple generally sees in other professional photographers portfolios. I often use my cell phone to create a reflection of the couple or, in this case, the Christmas lights dangling in front of the lens to create a magnificent foreground bokeh, or a layman terms these big globes of light that create an additional element of interest in the photograph. Here, the beautiful red lights also create a frame that draw the viewer's attention towards the couple. Also, the symbolism of the light is clear as red is the colour of love and symbolizes the love between the bride and groom.